Last week carried a few important events. Everyone was well aware of Valentine's Day on the 14th. One of my children celebrated a birthday. 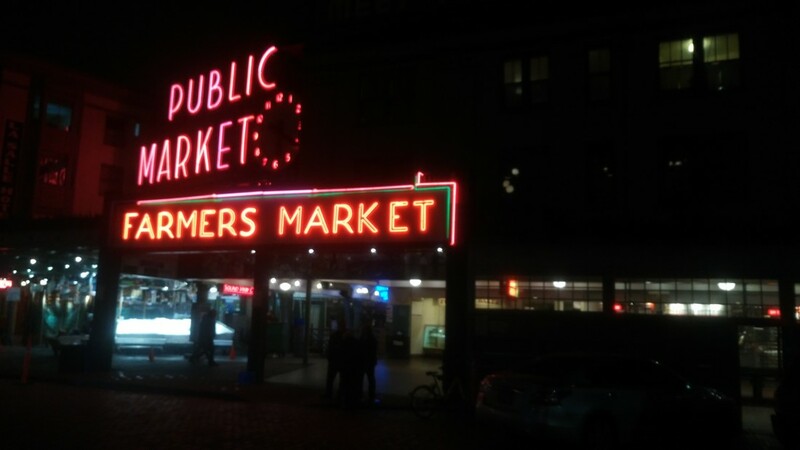 And, the annual NCCE conference took place, returning this year to one of my favorite places, Seattle, WA. This year I was excited--and honored--to be part of a panel session with fellow Microsoft Innovative Educator Experts Richard Snyder, Cheryl McClure, Tamara Truax, Andrea Tolley, and Melissa Wrenchey. 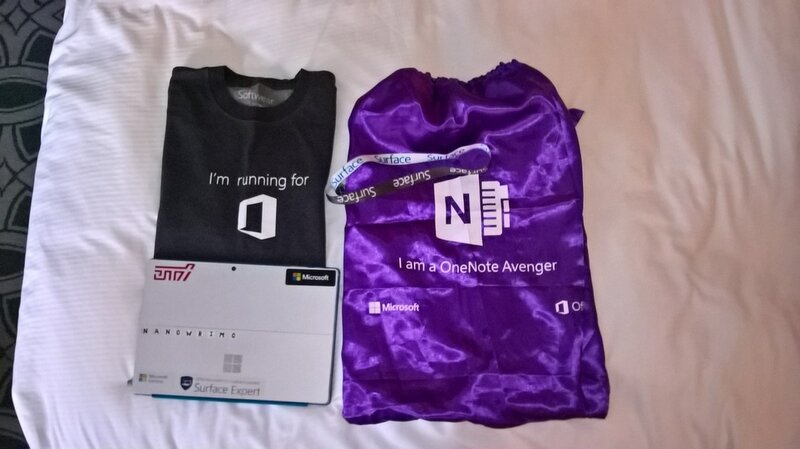 We served as the OneNote Avengers Panel Discussion, or forum designed to expose attendees to examples, tips. And tricks from real educators' Class Notebooks. If you weren't at NCCE or were but missed our session, click HERE to access the OneNote book that shares the content we covered. 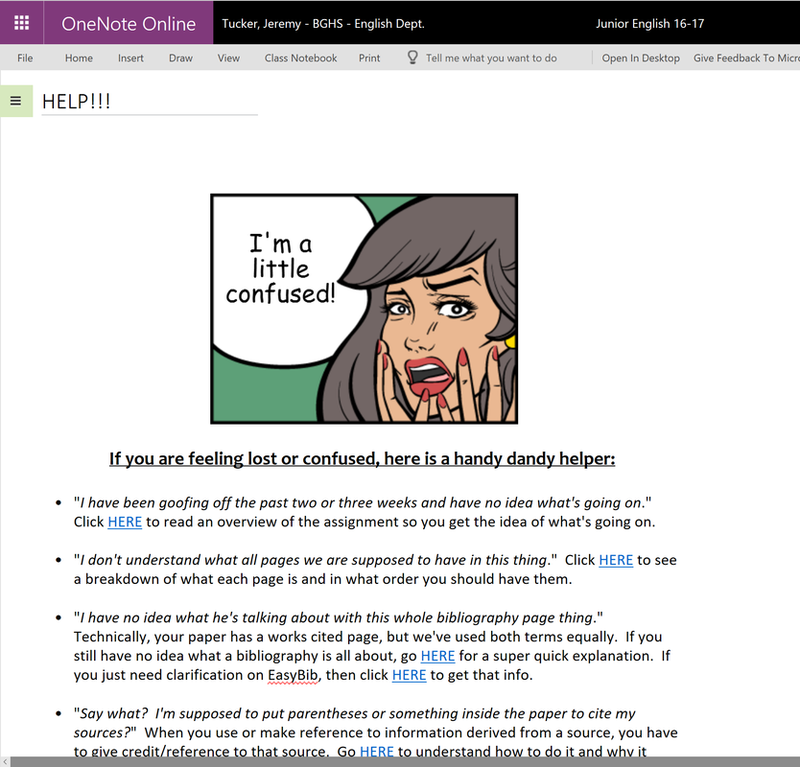 If you're an educator using OneNote, it's a great resource. If you've never attended the NCCE conference, I highly recommend it. Very well organized with a healthy variety and volume of sessions. I suppose it's a "mid-sized" conference when compared to bigger ones like ISTE and FETC, but it still has a "pro level" feel to it. Granted, the expo hall is not as big. It also, for whatever reason, does not host any poster sessions, which I have learned are fantastic ways to engage with topics and techniques in a window shopping atmosphere. 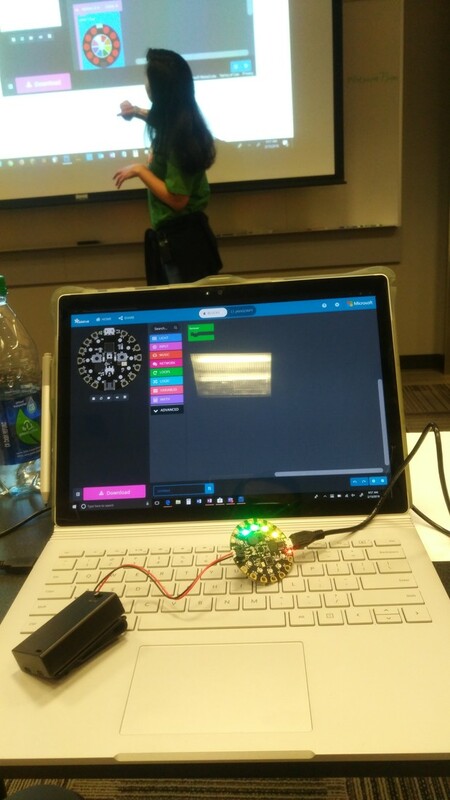 Another exciting component of this year's NCCE conference was an exclusive day of learning, exploring, and having fun together at the Microsoft headquarters in Redmond. 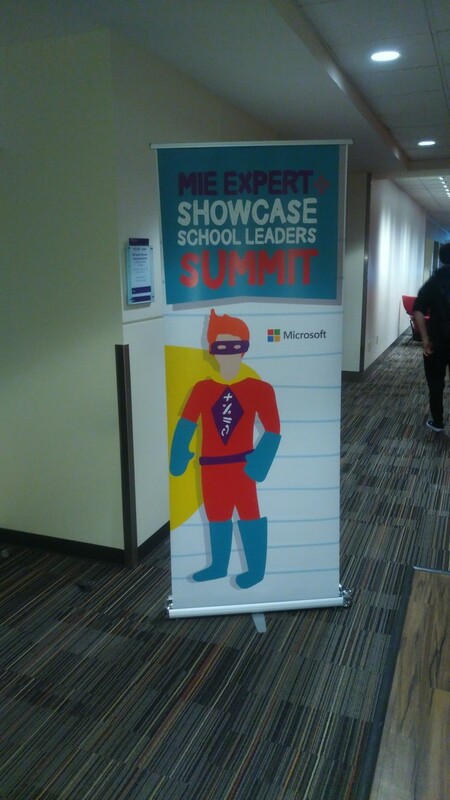 As a Microsoft Innovative Educator Expert, I was invited to participate in the all-day summit with fellow MIE Experts. It was a fun, educational, and--I suppose most of all--inspirational day. If you'd like to learn more about the MIE Expert program and how you can become a part of it, click HERE. Yes, this site has been quite the dead zone for some time. My wife and I welcomed a new kiddo to the mix at the first of September, and thus I needed to take a break from a few non-essential areas of life. So, I put the blog on hiatus. Nothing new this week, but new posts will be arriving very soon.! 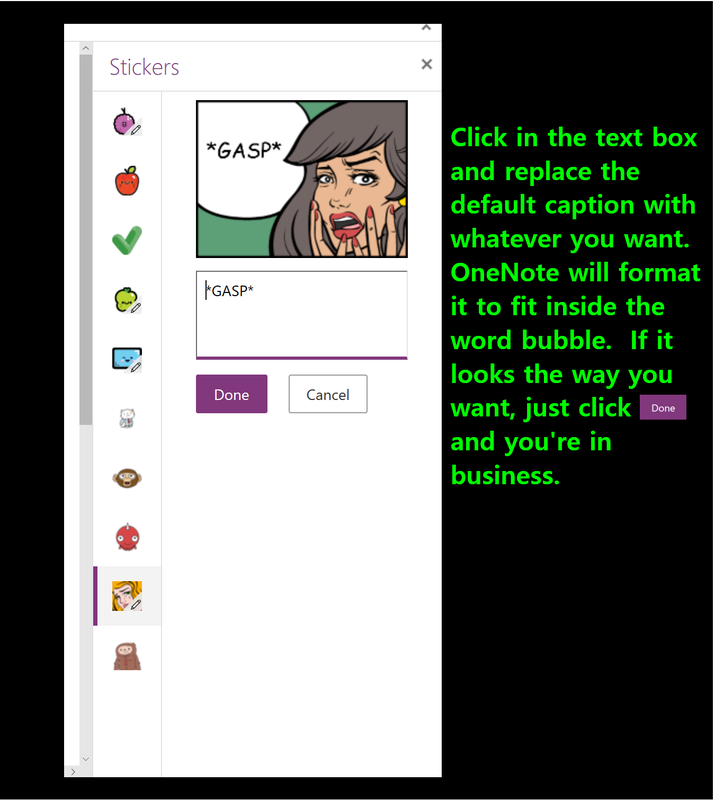 With a number of useful new features added to OneNote this past year, I must admit that the Stickers addition did not make my excited-about list when released. For one thing, I am a heavy user of the OneNote 2016 desktop version, and Stickers did not find a home in that version, so my exposure to it was limited. With the online version of OneNote now toting more power than ever, including inking and Class Notebook, I have found myself using it more during the work day than I used to. Thus, my budding affection for Stickers. In essence, these digital "stickers" are just a fun collection of clipart images pasted onto your OneNote page. They are arranged in a handy, organized menu that makes them quick and easy to insert, though. I was won to the sticker side, however, as I played with the feature a bit and discovered it included several options of custom-text stickers. Now, that was exciting. 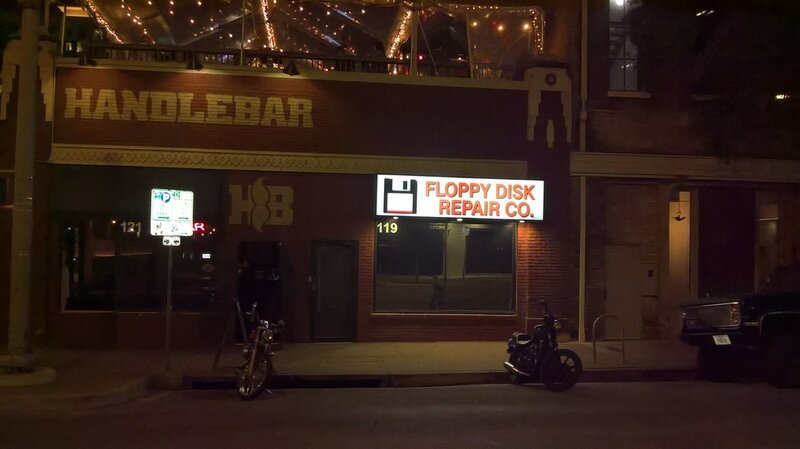 ​Reposition if needed. The stickers will act like any other inserted image, so the method of positioning, moving, and resizing is the same. The evolution of OneNote's Class Notebook has been revolutionary for many teachers, especially for those of us who were using OneNote with our students before Class Notebook was even a thing. Since its introduction, it has continued to experience updates that continue to make teachers around the globe say "I can't imagine my school life without Class Notebook." ​That's a testament to the OneNote team at Microsoft for getting it right in the initial design and updates created for Class Notebook. While OneNote itself has been around for over almost fifteen years, Class Notebook is still a fairly new application. The team at Microsoft have been very receptive to accepting input and ideas from real-life classroom teachers, and as it continues to develop, we as consumers will continue to experience thoughtful additions to its feature set. With that being said, like anything in life, and especially at work, nothing is without some imperfections. ​As a high school teacher, I teach several different classes of the same prep. They all follow the same curriculum and syllabus. For me, it makes more sense to put all of those students from different class periods together in one Class Notebook. Many other teachers do the same thing. By default, Class Notebook will organize everyone in your class notebook alphabetically, which is last name first, unless your IT folks set up student accounts differently than the norm. As such, it can sometimes be inconvenient to sort through student sections, like when using the Review Student Work feature of the Class Notebook ribbon, because everyone is mixed in with everyone else. If that describes your situation, here is a simple solution that will bring some much appreciated order to your Class Notebook. ​Yes, this takes a little time to accomplish. No, the pane that lists all your students can not be pinned and therefore requires you to click it to expand open after each time you change a name. Still, the order it creates is worth all that clicking. Hopefully this is something the OneNote team can address in future updates to simplify the process. And don't worry--this does not affect the students' login credentials or mess up any soft of data syncing. You are only changing the appearance of names in your notebook. You are not messing with or affecting actual student account elements. This is a super quick tip for working with objects in OneNote. (Or Office in general.) Ever tried to move around an image or object so that it is just so...only to be met with frustration because it just wouldn't fall into place exactly where you wanted. We've all been there. Now, use the simple trick below to move objects smoothly and with precision from now on. I've been very blessed to be able to travel around this school year and present at several education conferences. 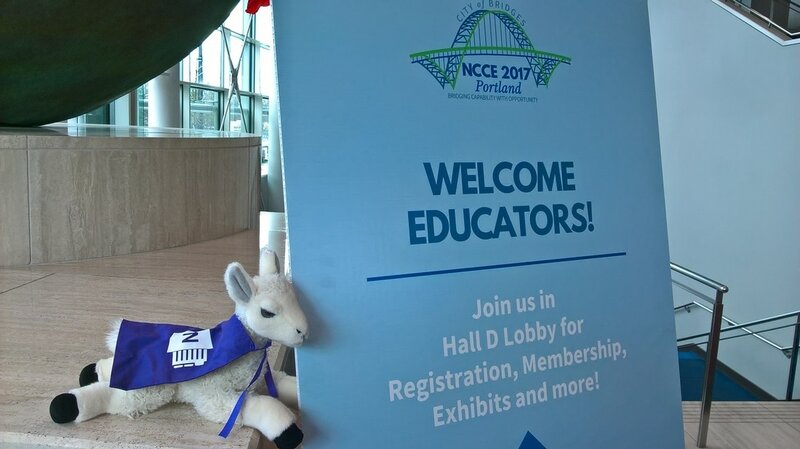 It seems fitting that one of my favorite conferences, NCCE, wraps up my 2016-17 school year of travels. Depending on whether or not my travel plans for ISTE pan out, this could also be the very last conference I am able to attend in 2017. 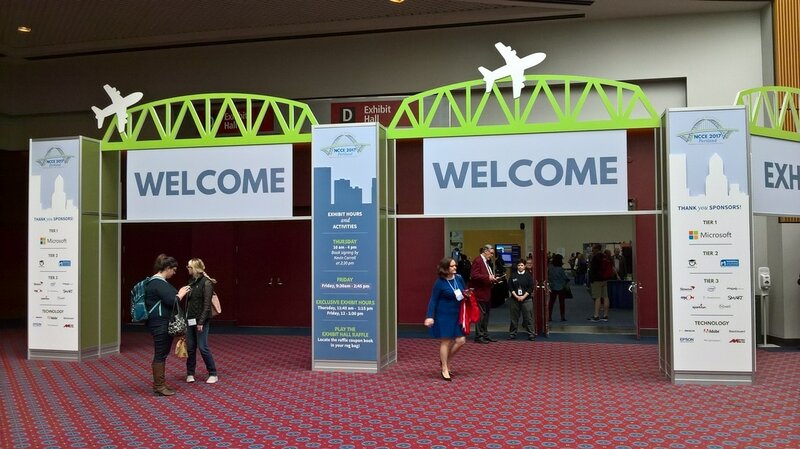 ​I was at NCCE last year, which was on Seattle. This conference has a very personal feel to it, which I like. Big enough to offer attendees plenty of offerings for workshops, sessions, and vendors. Small enough to feel like you're an involved part of the mix. After experiencing the conference twice, it is obvious that the organizers and planning committee(s) put a lot of thought into putting together this conference. With all that said, the conference did feel a bit smaller than the previous year, though I never asked an official registration of the two to compare. It may have just been the times of day I happened to hit various portions of the convention center. Either way, there was plenty to see, do, and experience. ​At the Microsoft booth in the exhibitor hall, there were ongoing mini lessons for a more quick-get. While they usually don't dig deeper than what I already know about my go-to products that I use and follow on Office Blogs, it's always an easy, quick way to catch a thing or two about the products I am not an everyday user of. I'm a big fan of these types of presentation because there's little commitment--lol. What I mean by that is that they tend to cycle, so if you miss a specific topic you were curious about, it'll roll around again before the conference is over. (Unlike many of the sessions you may be interested in.) The other is that they are brief, so you don't feel your schedule is thinned. 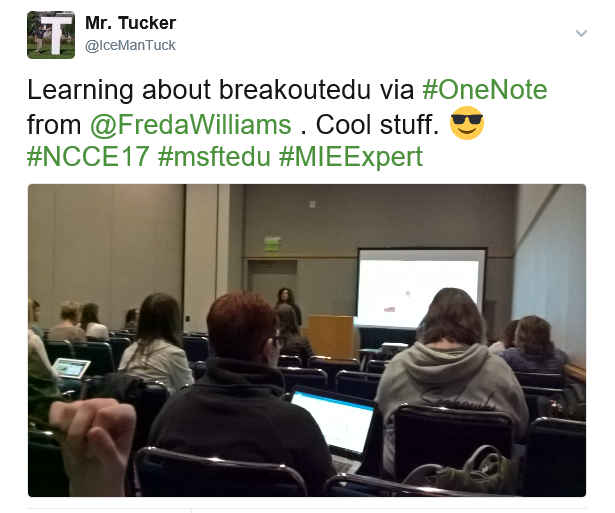 ​One of the sessions I was really curious to grab some ideas from was about using OneNote for breakout EDU. (Yes, I have a one track mind with ed-tech apparently...) I have used OneNote for a breakout activity at the beginning of this school year, and it actually went over well. It took some planning and practice runs to get it going, though, along with some experimenting. It's always to good to sit and learn from those who have paved the way. So was there anything I can say negative about the conference? Yes--it rained....a lot. 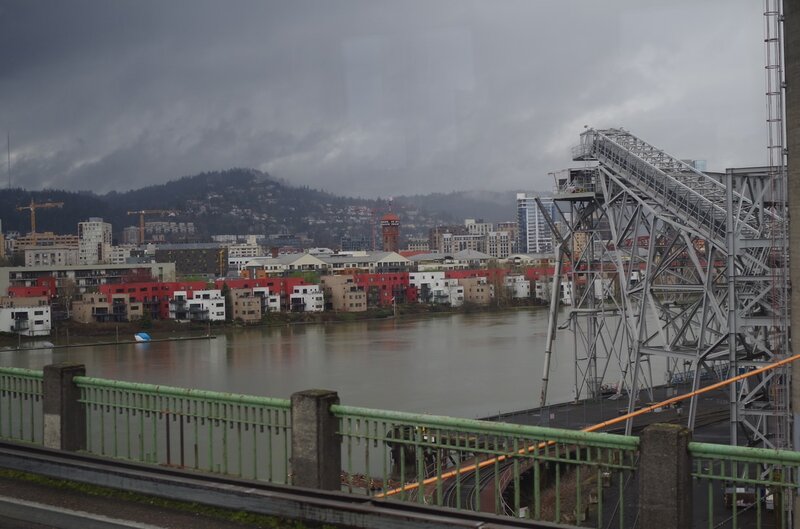 I feel like I never really got a true taste of Portland because it rained every single dreary-weathered day I was there. 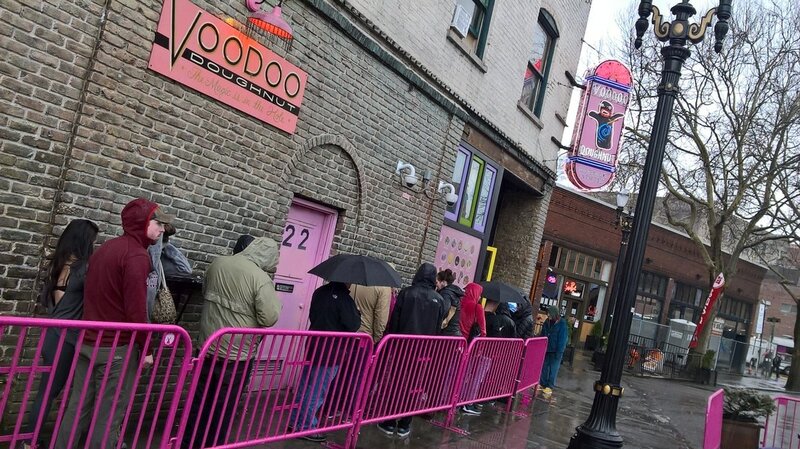 (Or maybe that was a true taste of Portland?) Honestly, though, that was the only disappointing thing about the trip. 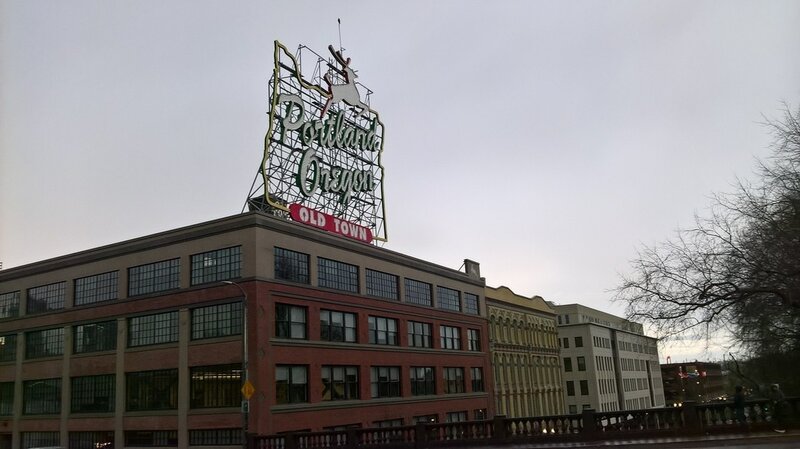 My flight home departed at 10:00 pm, so I did have some free time to go and explore Portland between conference close and flight boarding. Thankfully, my Timbuk2 backpack was weatherproof, so my Surface Pro 3 stayed nice and dry, while the rest of me got soaked a couple of times. I love the South. 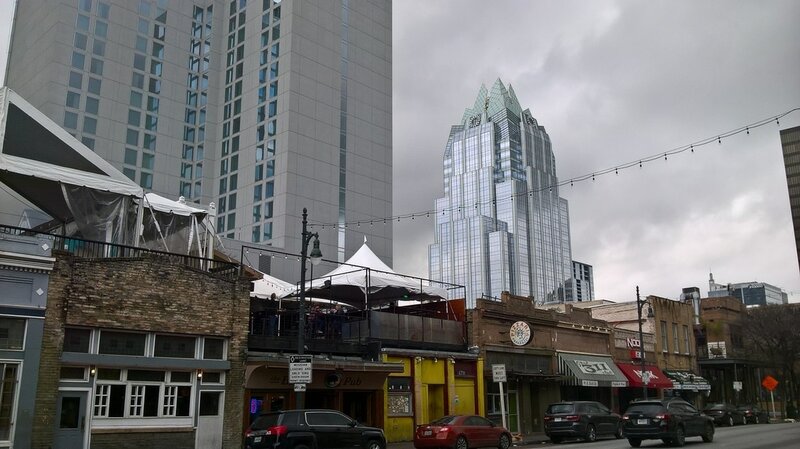 I've been fortunate enough to attend a variety of conferences in cities across the country, and I've noticed something this year. 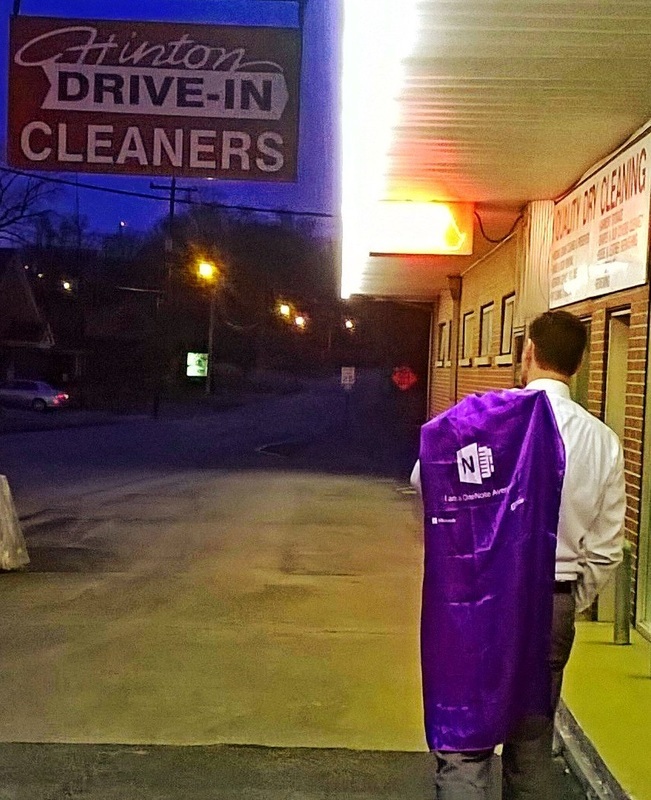 There is big interest in OneNote in the South. 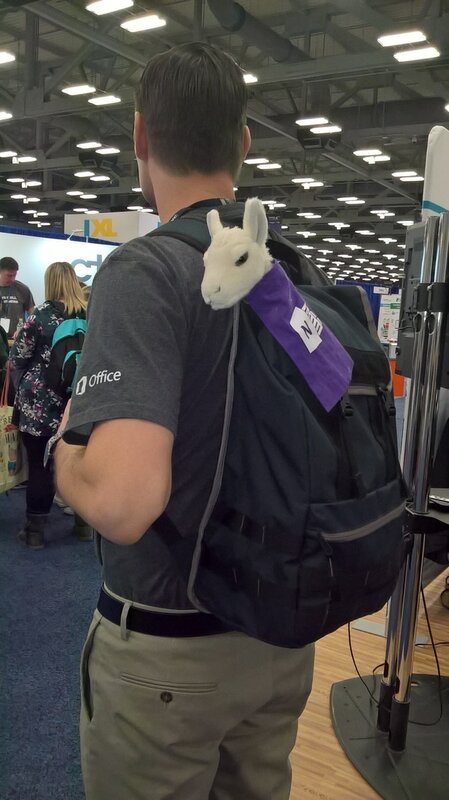 I was invited to TCEA to present my Class Notebook Boot Camp workshop, which is designed to get participants equipped with the essentials to start rolling successfully and confidently with OneNote in their classes. I'm a huge fan of OneNote, and I honestly get excited when I am able to share its awesome potential with other educators who are curious to learn just what Class Notebook might offer them and their students. I arrived outside my conference room about 30 minutes before my session was to begin. As the pervious session using my room ended and emptied, people began filing in for our Boot Camp workshop. We were at max capacity in the lab 15 minutes before start time, so I received the group's blessing to go ahead and start the workshop early...which was a good thing because we ended up being crunched for time at the end. ​The only complaint I could have for TCEA was that on that particular day there were problems with the wifi. That's very understandable when you have such a large crowd of people at a technology conference, but still potentially frustrating. Thankfully, many of the participants were seated at conference provided laptops, which had a wired connection. I was presenting from my Surface Pro 4, and thankfully I was able to use my cell phone as a wifi hotspot. I also had a few flash drives on hand just in case a connection issue got in the way of downloading our practice Class Notebook. A small hiccup that thankfully did not throw us off pace. 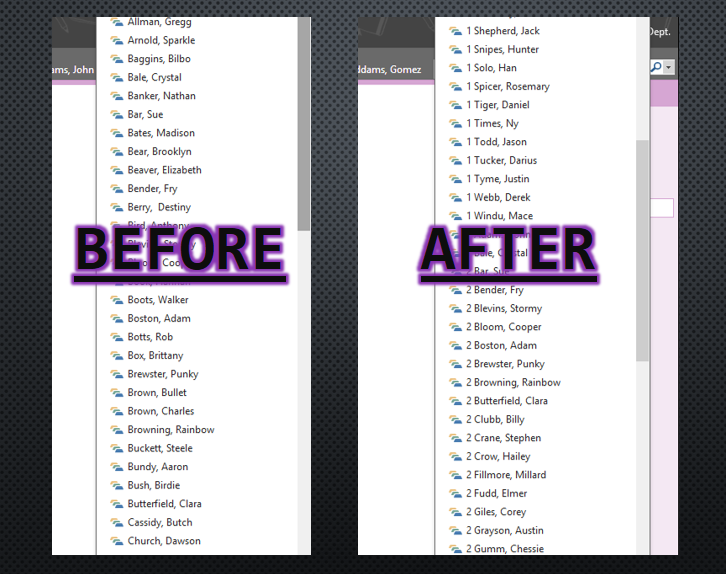 One of the great things about OneNote is that the application does SO MUCH. It is extremely feature rich. One of the bad things about presenting a workshop on OneNote is that the application does SO MUCH. Boot Camp is designed to be a 3 to 4 hour hands-on workshop, and it isn't a simple task to modify it to fit inside an hour and a half. So, we didn't quite get through everything on our list before the next session's presenter and attendants were waiting to take over our lab. Still, we did cover a lot of ground, and I sent everyone home with the resources to finish up at their own pace on their own time. 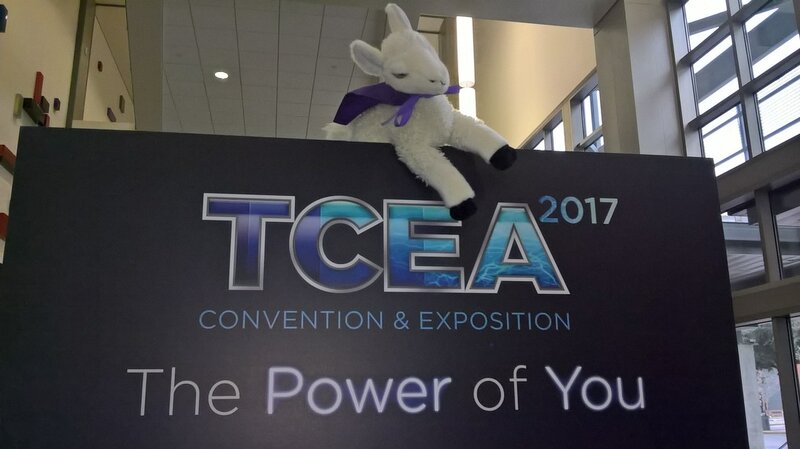 As an attendee, I thoroughly enjoyed the atmosphere and setup of TCEA. A well organized, easy to navigate event. Unlike some conferences, there were plenty of places to hang out, recharge, and relax in between sessions. The placement and availability of conference staff and volunteers was great. And the offering of sessions, workshops, and keynotes was equally satisfying. While shuttling from the hotel one morning, some local Texans who were TCEA regulars said that there was talk of relocating the conference to a different city, which would be kind of sad because I felt like Austin's conference center was an incredibly nice, well laid out facility that was conveniently located in downtown. 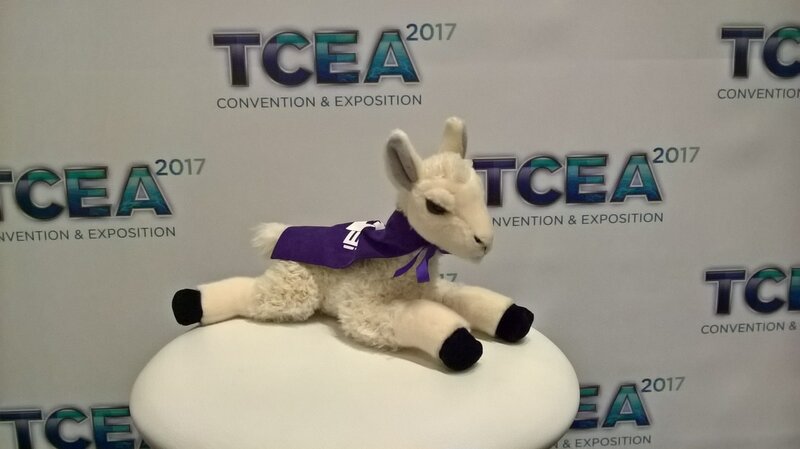 Regardless of where it ends up being held next year and/or years that follow, if you have the opportunity to attend TCEA, it is well worth being a part of. 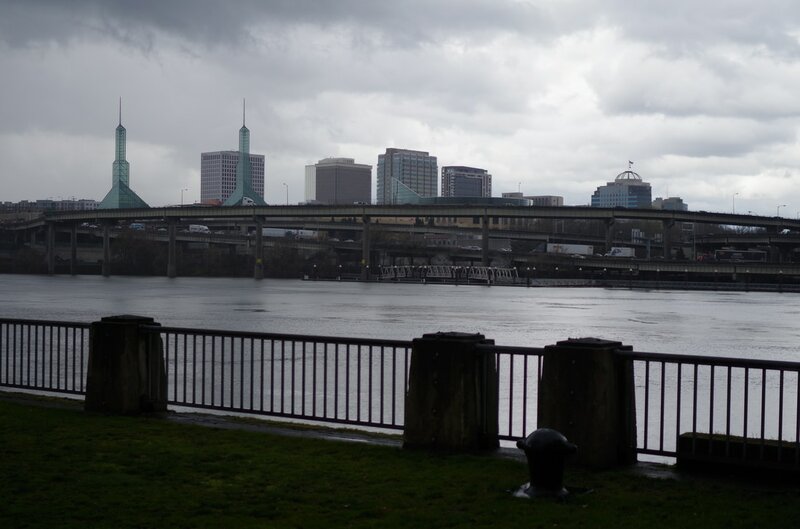 Next month I get to present at the NCCE annual conference, this year being held in Portland, OR. It is another exceptionally planned/executed conference, and I can't wait to attend. This may be my last conference for 2017, so it'll be extra sentimental for me. Traveling to Florida any time of the year is always a good thing, but it is doubly nice if it's during the cold winter months of your home state, and triply nice if the trip lands you at the FETC annual Future of Technology Conference in Orlando. ​The warm sunshine isn't the main attraction at FETC, however. This ed-tech conference is in its 37th year, this time pulling together around 9,000 teachers, January 23-26. And the Orange County Convention Center is huge. As in, has its own zip code large. (Okay--maybe not.) Even with the massive spread of space in the convention center, FETC had a noticeably full feeling each day I attended. Even though this was my second year attending, I still felt the awe of stepping into the expo hall. Of the conferences I've been able to attend, I would say FETC is second or ties for second right behind ISTE when it comes to the size and fullness of the exposition hall.. 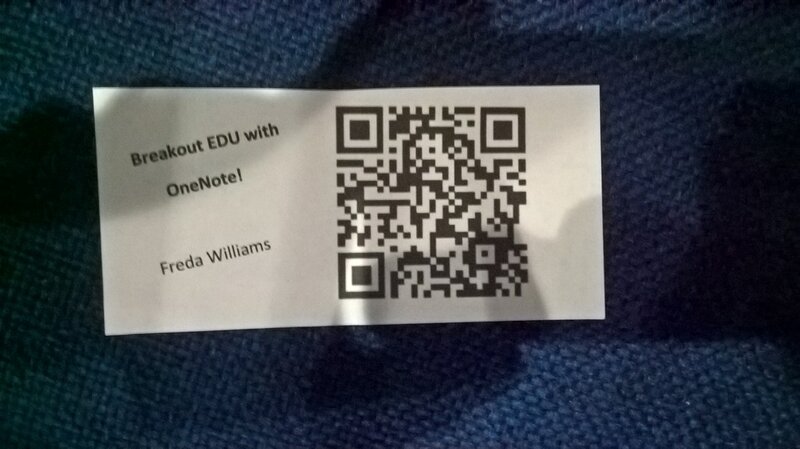 Yes, I was excited to be presenting at FETC on my favorite education tool, Microsoft's OneNote. Yes, I was looking forward to attending some sessions to broaden my teacher skill set and perspectives. Still, there was another gnawing anticipation about attending FETC…and that was the hope of getting my hands on the still new Surface Studio and Surface Dial. ​The Microsoft area of the expo hall was a hive of activity, so I had to wait my turn to get to the Surface Studio. Obviously, I was impressed with the device, but was equally pleased to get my hands on the Surface Dial, which felt incredibly intuitive. People who work in art, web design, photo editing, and all areas of graphic design will fall in love with this device. As a former hobbyist photographer/re-toucher, I can see the potential workflow empowerment of those who make the upgrade. Unfortunately, I will not be purchasing a Surface Studio anytime soon, but the Dial will be getting delivered to my door this spring, as I think it still will flex some usefulness to the Surface pro 4. 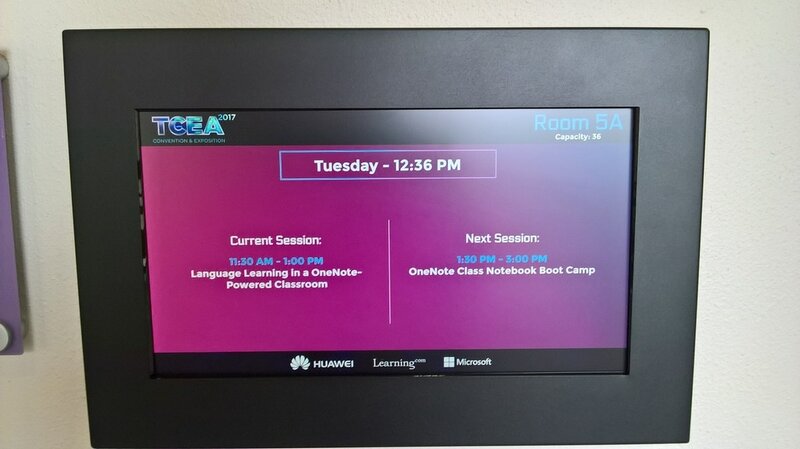 On the last day of the conference, I presented a hands-on workshop in one of the computer labs: OneNote Class Notebook Boot Camp. This was an 8:00 a.m. session, so I was very pleased that the room was filled, as I was a little nervous people may be tempted to sleep in that last day. I had one gentleman say that he changed his flight home so he could attend my workshop. No pressure, right? Class Notebook Boot Camp is supposed to resemble basic training for the various branches of the armed forces in one way: It is meant to equip you with a foundation of the core things you need to know. Not everything there is to know, as that would take much longer than a 2.5 hour workshop. Rather, Class Notebook Boot Camp teaches the essentials of what you need to start rolling comfortably with using Class Notebook in the classroom. ​I felt kind of like a bandit, because right after my session was over, it was time to sprint back to the hotel, check out, and hit the path homeward. 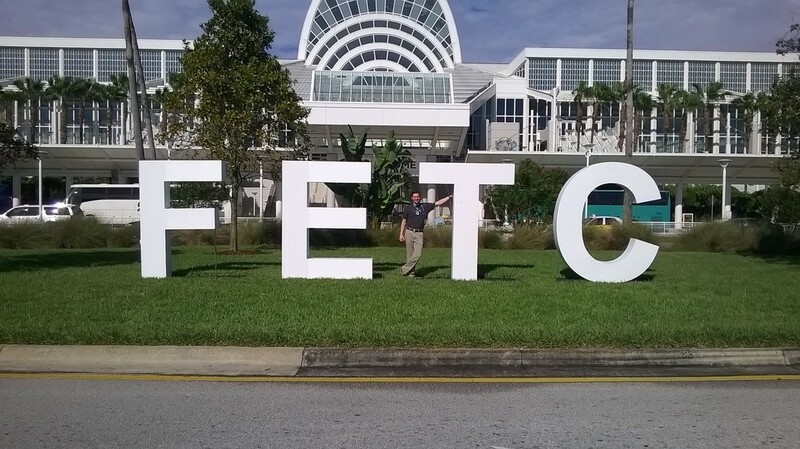 The folks who put together FETC annually know what they are doing. It is a well oiled, smooth running operation with lots to keep participants engaged. I hope I am able to attend again very soon. 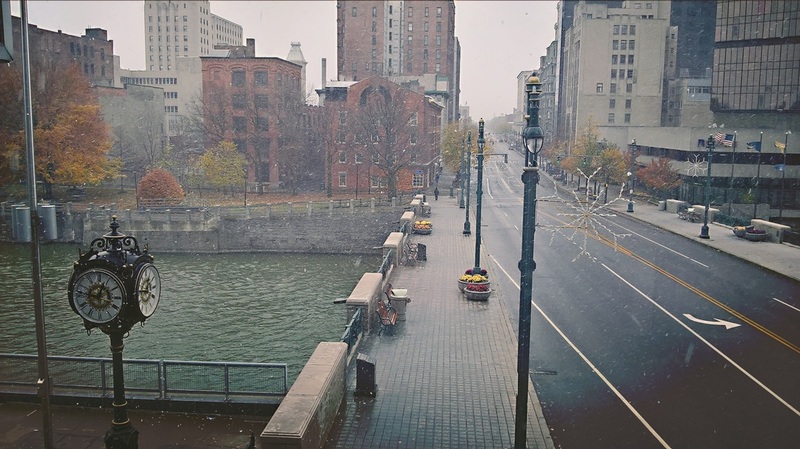 As the 2017 NYSCATE Annual Conference was about to get started on Saturday, November 19, a snowy storm was blowing into Rochester. As a Kentucky native, snow and cold and wind are not exactly strangers to me, but I'm certainly not used to experiencing them before Thanksgiving. Fortunately, there was more than plenty happening inside the Riverside Convention Center to make staying inside more treat than necessity. The New York State Association for Computers and Technologies in Education holds its annual gathering for educators and school staff across the state of New York, though they are more than happy to welcome out of state interlopers like myself. As part of the Microsoft Innovative Educator Expert program, #MIEExpert, Microsoft had sent me to the conference to present a couple of sessions on OneNote. 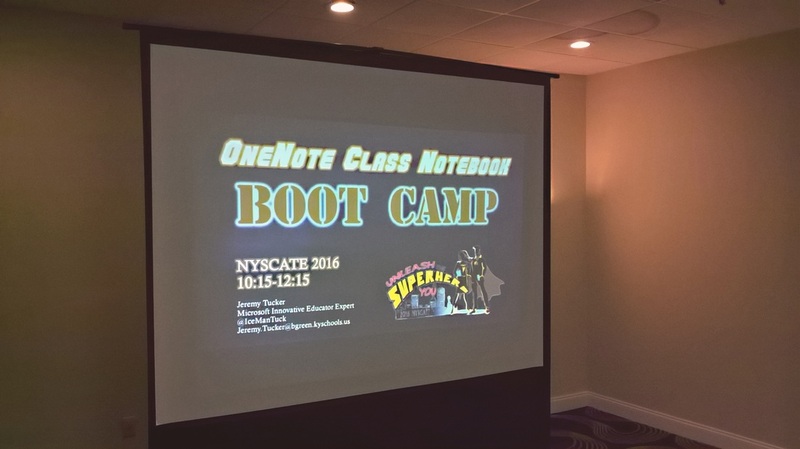 This was my second year to attend NYSCATE, and both experiences have convinced me that this is one of the best ed-tech conferences out there. The best way I can describe NYSCATE is that it is an event that has a big conference feel with a small conference connectivity. I've been fortunate enough to attend some much larger conferences such as ISTE, and I can honestly say that they hold nothing above NYSCATE. (In fact, the opposite may be the case.) Walking through the conference center, the look and feel of NYSCATE is that of a much bigger production. 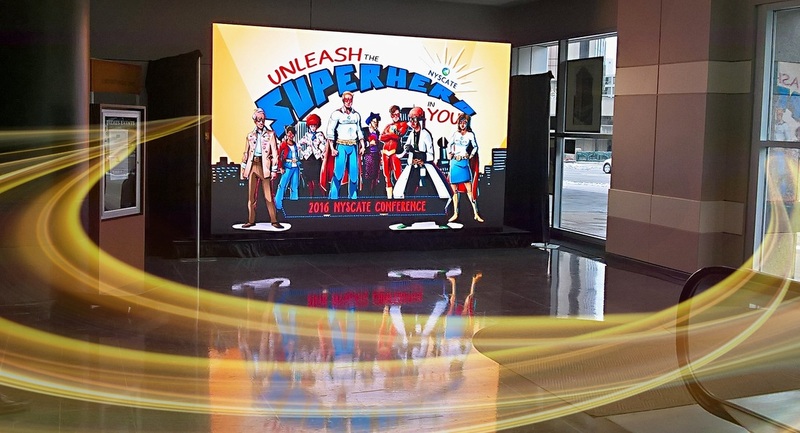 ​This year's conference was super hero themed, and the folks who put this event together did an awesome job pulling that theme together and blanketing the conference experience with it. 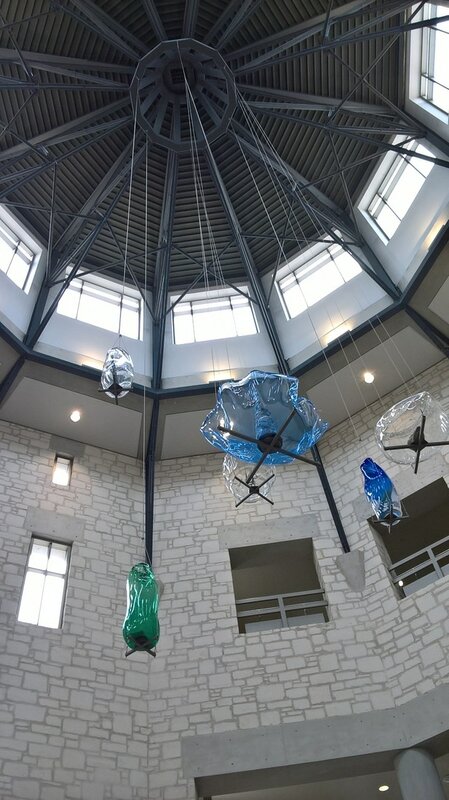 ​There were super hero decorations and references throughout the conference center. Participants were given conference super hero capes upon check-in. A phone booth for your caped educator transformation stood in the conference center main lobby. There were even conference themed chocolate bars. 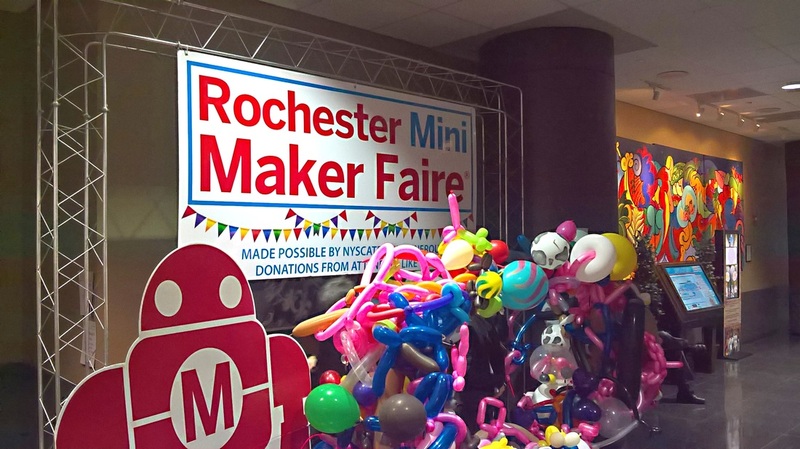 On Saturday, NYSCATE started with the Rochester Mini Maker Faire. As a conference participant, I was able to get inside and experience an amazing event put together for and by the community. 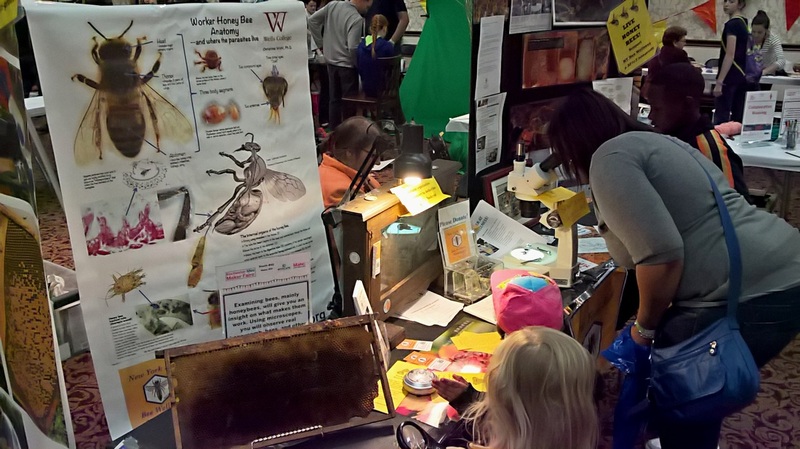 There were all kinds of different informative and hands-on booths set up for students and their families to experience. For any schools or communities looking to start your own mini maker fair event, I highly recommend taking a deeper look at what NYSCATE put together here. 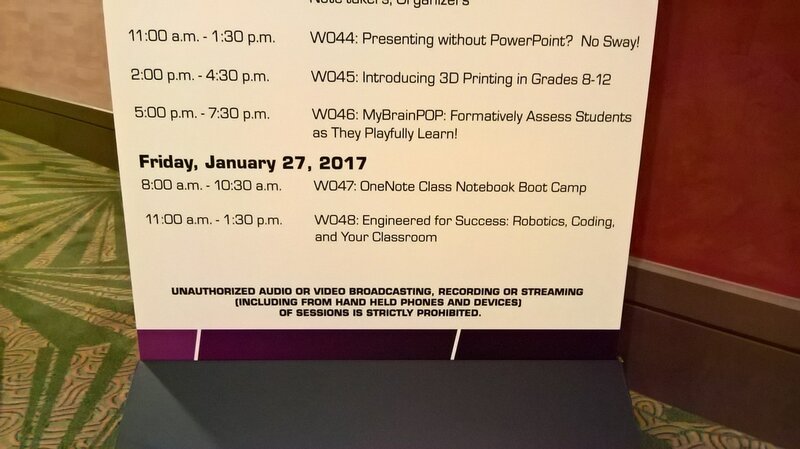 I was invited to present a 2-hour workshop and a general session at the conference, both featuring Microsoft's OneNote application. The OneNote team, along with a batch of passionate educators, have done an amazing job of promoting OneNote in education this past year or so. 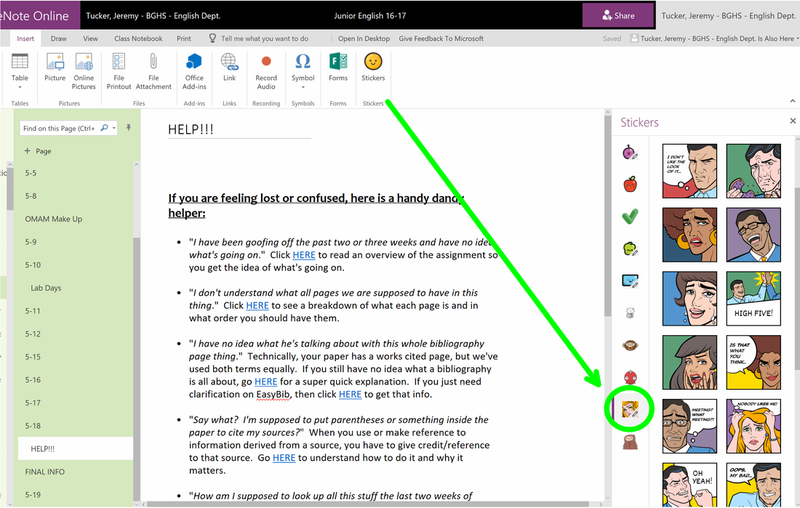 Obviously, the team has really strengthened OneNote with additions of the Class Notebook and Learning Tools add-ins, as well as other cool features like the ability to embed videos and Forms quizzes, as well as other improvements. Now, when I mention OneNote or Class Notebook in casual teacher conversation, people tend to know a lot more about the product than they used to, as its power to empower students and curriculum has really started getting attention. It's quickly becoming more of a household name among educators. 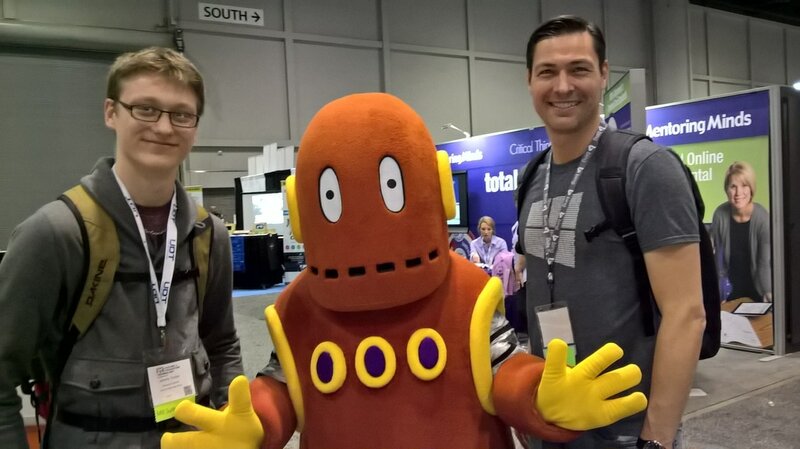 There's a visible curiosity and interest in OneNote's Class Notebook that has started to boom, and I'm excited to be able to travel to a few different conferences this year and share my OneNote experiences with others. As a classroom teacher, it's one of my favorite things to talk about. A special shout out to two great products: Microsoft's Surface Pro and the Screen Beam wireless projection device. Since getting a Surface Pro a couple years ago, my computing life has been transformed, especially in my job as a teacher. Surface's Digital Ink technology is amazing, empowering, and, I believe, the future of learning devices. I love the mobility of presenting with my Surface, and Screen Beam does an excellent job of letting me do so, especially on older VGA-only projectors. Not only did I get to hear a real NASA astronaut speak, but I also got to be a "hero"--his words, not mine--by holding the hotel elevator for him later that day. Astronaut Mike Massimino also provided me with one of my new favorite quotes: "Just remember: No matter how bad things are, you can always make it worse." 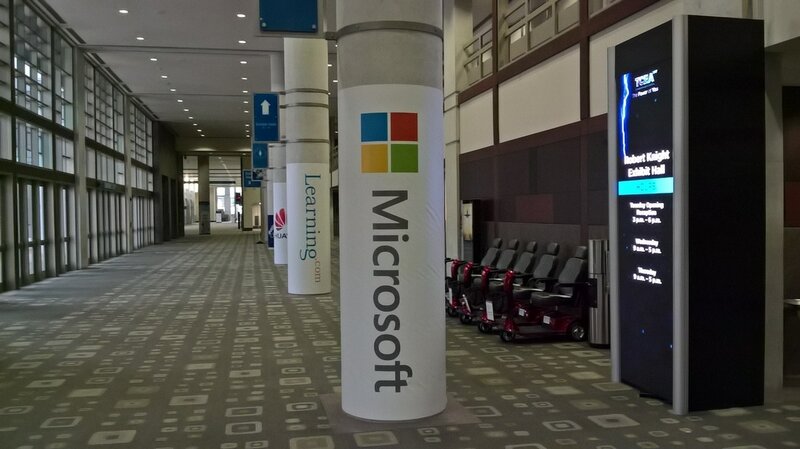 Microsoft had set up their interactive booth on the upper level of the conference center. 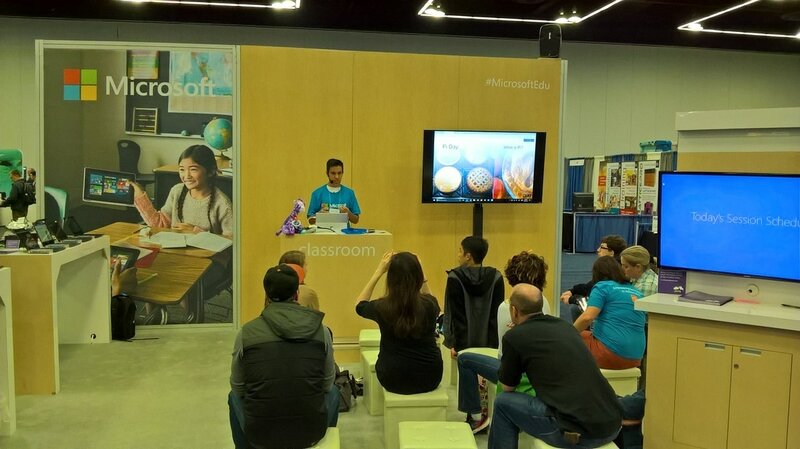 Throughout the event, various Microsoft employees and trainers provided quick, free workshops on different Microsoft in education products. I had been super excited to check out the new Surface Studio for the first time, but the bad weather that hit the region just before the conference had prevented it from making an appearance. Still, there was a lot of great learning and hands-on sampling of devices that took place here throughout the day. This is the scene right outside the conference center in Rochester. Even with cold, it's a beautiful spot. For a Kentucky boy, going to New York and experiencing some snow on the ground in November is a special treat. I'm no stranger to the cold and the wind, but I'm certainly not used to experiencing it this early in the season. I, of course, did not come prepared and had to run to a little store down the street to buy some gloves and something to cover my head. 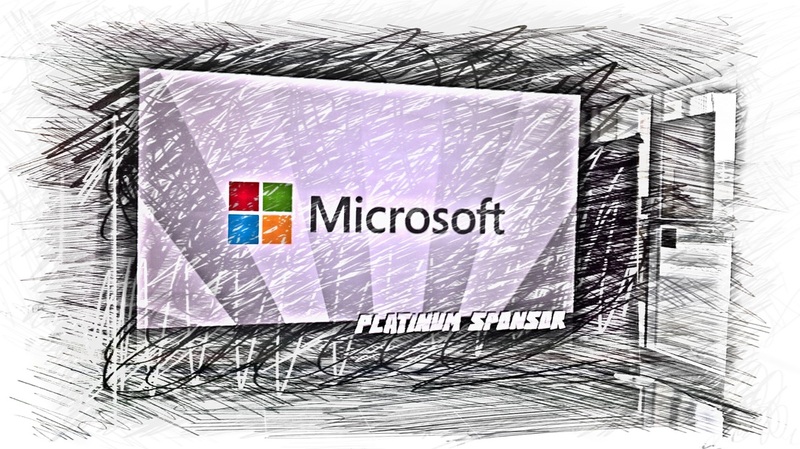 A special thanks to Microsoft and their Innovative Educator Expert program for making it possible for me to travel to this conference. It truly is one of the best in the country, and I'm so glad I got to be a part of it again this year. If you're still keeping your class seating charts on paper or some separate digital form, consider taking your seating charts to a whole different level via OneNote. From rearranging assigned seats to keeping track of assigned book numbers to marking temporary information, OneNote empowers your seating charts. I am an 20 year veteran of the high school classroom. I love working with young adults, and I love when useful tech can empower self-reliant learning.